Rugby isn’t my sport as a rule but last weekend I watched the last 20 minutes of England beating Australia in the World Cup. In the evening I turned the TV on to catch the end of the France V New Zealand game to see who England would play in the semi final. I spent the next 20 minutes transfixed, unable to watch the game, only able to watch the most magnetic, charasmatic, incredible man mountain of a sportsman I have ever seen. 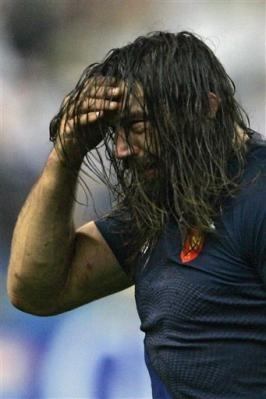 Sebastien Chabal. As an addition, my heart bled a little after the semi final defeat. But only a little. Even in defeat he created an image that transcends mere sport. He is a true icon. This is my ode to Sebastien Chabal. A vision in blue lycra. Art, beauty and the beast. Wow. you seem to talk about Sebastian Chabal all the time. You seem to concentrate on Chabal instead of the game. That poem is awesome, daveross. Seriously. The antisocialist, for one, loves it — and that’s not just because he looks like Mr. Chabal. Only one rhyme approaches an ever-so-slight trace of artifice: blue lycra. Now what the hell could be construed as controversial about somethine so excellent? Ultimately, this is a panegyric. It’s beautiful. Without exception, without hyberbole, this is the antisocialist’s favorite thing you’ve written. Ever.